Located at the end of a quiet country road, surrounded by state forest, you could not possibly find a more serene setting for this secluded and unique bush retreat. This spectacular design brings together influences from tin shearing sheds, churches, and the verandah-skirted ‘Queenslander’ to create an Australian homestead that fits perfectly into its outback setting. 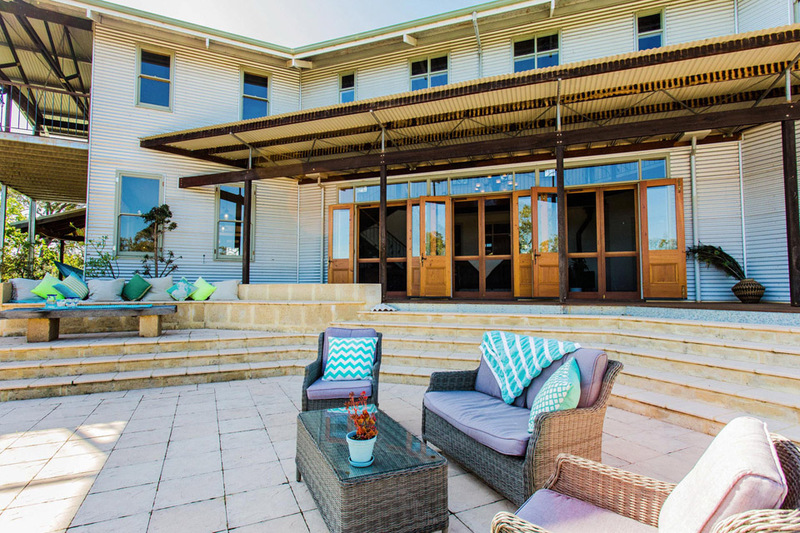 The custom-designed, two-storey home, sits on the edge of a dramatic breakaway overlooking the Moore River, and was constructed using carefully-selected materials. The property itself encompasses 49 hectares (122 acres) of stunning native bushland, bursting with wildflowers and home to an abundance of rare native birds and wildlife, as well as 750m of direct Moore River frontage. The open-plan design has few internal walls and a mezzanine upper floor, allowing the natural light, breeze and views to flood the internal spaces. Polished Jarrah boards are contrasted with Blackbutt edging and hand-made pine doors. The kitchen and bathrooms feature hand-crafted Marri bench-tops, while the staircase and upstairs balustrade combine Tasmanian Oak railing and wrought iron balusters. Each upstairs bedroom has its own private balcony, where you can sip your morning coffee and take in the stunning views. From the spacious main living area, French Doors open up to a deck that steps down to huge limestone entertaining area. Other amenities include an all-purpose shed with living quarters, water tanks, bore and an olive grove.